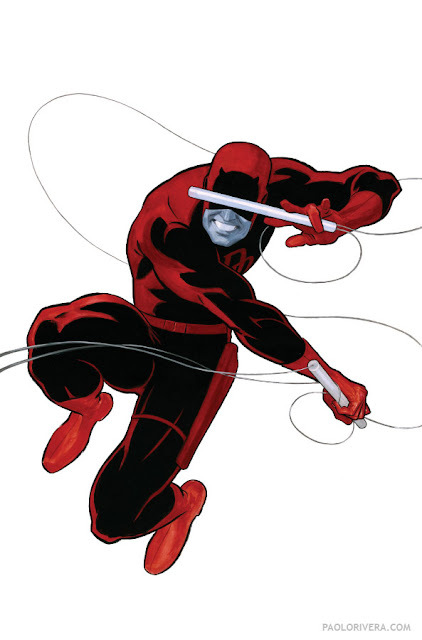 Daredevil #1 Cover. 2011. Gouache on bristol board, 11 × 17″. Finally! I can finally talk about this! I'll be joining Mark Waid and Marcos Martin, two of my favorite creators, on a relaunch of Daredevil this summer. You can check out the full details at marvel.com. There's actually a background to this image, but it's just too awesome to show. Or maybe I just got really, really sick this week and couldn't finish it by the deadline. Either way, I'm better now, and there will be one eventually. Time to work! Congratulations! As one of the biggest Daredevil fans around, I'm really looking forward to seeing what you guys can bring to the table. I couldn't be happier to see you onboard my favorite title. Congratulations, and I look forward to seeing your work here, and some Wacky Wednesday stuff from Daredevil. Thanks for confirming the rumors, cannot wait for it. Big congrats on the DD gig, Paolo!!! I'm now OFFICIALLY excited. Actually hadn't heard you would alternate with Marcos Martin until now. Since it was unlikely you would be doing 12 issues a year ( even with your dad pitching in ), Marcos is awesome news too. Can't think of two artists currently working at Marvel whose work I dig more ( Chris Samnee being a close third ). 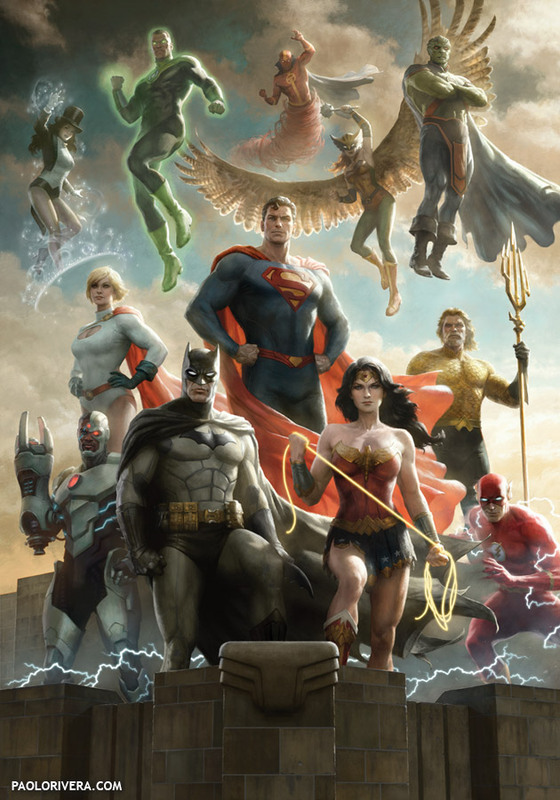 Oh, and Mark Waid isn't bad either. Anyway, first time in ages I've been so pumped about a relaunch. May I ask what issue will be your first ? Man. Three of my favorite creators on one title! Everyone wants Marcos on everything. I hope Marcos is still on Spidey, though! What style are you using for the book? Can you use your usual techniques on an ongoing monthly? Just watched your interview at http://www.thecomicarchive.com/archives/839 where you showed your equipment and techniques. Looking at that awesome background that you're putting behind DD in that cover, and watching you wield that maulstick, man, that confirmed to me that you are also one helluva draftsman along with the painting genius I've seen. (Most people don't even know what a maulstick is!) I learned drafting "old school" with the implements you describe, and to know someone is out there who doesn't rely totally on the computer makes me so very happy. Love how you integrate the new tech to facilitate your well-honed craft. Bravo, sir. Wow. DD is certainly going to be the best drawn book in the Marvel stable (if not in all of supers). Great news Paolo. I'm really looking forward to it! Amazing news! When Marvel: Mythos came out I wished there had been a Daredevil one and now with this announcement I couldn't be more excited. Congrats Paolo! That's awesome news. I've been a big Daredevil fan since Marvel Knights but I have to admit that I wasn't a big fan of what happened recently with Shadowland. But now with this announcement I'm really looking forward to your run with Mark and Marcos. I look to you and Marcos as producing some of the most considered comic storytelling today (I believe his Shocker and your Punisher tales on ASM were back-to-back). The notion of the both of you visualizing the world via Matt Murdock's "eyes" is exciting indeed. DD has seemed to be a character/ book that allows for envelope pushing and I hope you both go to town on it. Mention of Klaw in the CBR article also suggests it will have more Pop flavor than the we've been accustomed to on the title. Christine, I've been perusing your site for background information; it's a great resource because I've had more than a few nagging questions about DD. Thomas, I'll be doing the bulk of the first issue, with Martin doing a back-up. I think we'll be rotating every 3 issues after that. Narciso, I'm afraid to say, Martin will be leaving ASM. But don't worry too much. I wouldn't be surprised if Spidey swings by. Andy, I'll be doing pencils (with my Dad on inks), but one artist will be coloring us both. Thanks again for all the kind words. Time to get to work! Looks like DD is in good hands. I really like the promo art I have seen so far. Good luck. Cannot wait to see you and Mr. Martin drawing one of my favorite characters, ever. Any chances to see the Black Widow coming back? Anonymous, I wish I knew, but I certainly wouldn't mind drawing her.